The Cleveland Branch NAACP will host the second in a series of listening tours regarding police brutality and other community issues. The tour will be held in the City of Euclid, Ohio. on Thursday October 19, 2017 at the Manor Party Center 24111 Rockwell Rd, Euclid, Ohio from 6pm -8:30..
Take a look back on a wonderful night. Click Here to watch the video. NAACP CLEVELAND BRANCH 16400 Miles Ave., Cleveland, Ohio 44128 | Phone 216-231-6260 | Fax 216-283-0115 | email: ClevelandNAACP@yahoo.com| website: http://clevelandnaacp.org FOR IMMEDIATE RELEASE MEDIA ADVISORY CLEVELAND NAACP FILES EXCESSIVE — USE OF FORCE COMPLAINT AGAINST CLEVELAND POLICE Contact person(s): Michael L. Nelson, Sr. mnelson@mln-associates.com 216-857-0340 James Hardiman 216-256-6544 attyjhard@aol.com July.. The ladies of WIN (Women In the NAACP) would like to thank everyone that attended their SPIN with WIN event. The event was well attended and a wealth of information was shared about healthy eating habits and exercise tips. Take a look for yourself! In a recently released study from Stanford University regarding police stops in twenty states, the data shows that African Americans and Latinos are more likely to be stopped, ticketed, and arrested than white drivers. Dr. Dunn was able to lend his expertise to the Atlanta Black Star as they attempted to.. This week on CounterSpin: The release of police dash cam video of the killing of Philando Castile after the verdict finding the officer who killed him not guilty is just the latest turn in this bewildering and upsetting story, now sparking protests around the country. What does the Castile case..
On Saturday, June 3rd, 2017 over 800 community members, leaders, elected officials, activists, and business leaders came together to Celebrate the NAACP Cleveland Branch for 105 years of Fighting for Freedom. 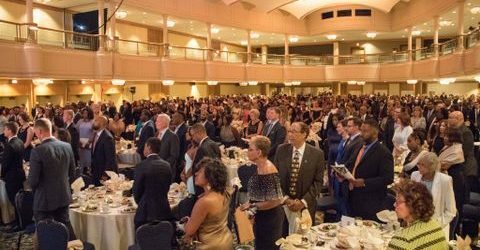 In a keynote address delivered by Hill Harper, attendees were encouraged to utilize their energy, passion, reason, and courage..